The internationally renowned, clinically tested, revolutionary diet program to lose weight, fight disease, and live a longer, healthier life. Can what you eat determine how long, and how well, you live? The clinically proven answer is yes, and The Longevity Diet is easier to follow than you'd think. 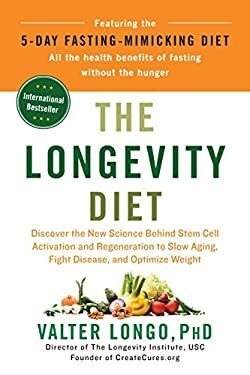 The culmination of 25 years of research on aging, nutrition, and disease across the globe, this unique program lays out a simple solution to living to a healthy old age through nutrition. The key is combining the healthy everyday eating plan the book outlines, with the scientifically engineered fasting-mimicking diet, or FMD; the FMD, done just 3-4 times a year, does away with the misery and starvation most of us experience while fasting, allowing you to reap all the beneficial health effects of a restrictive diet, while avoiding negative stressors, like low energy and sleeplessness. Valter Longo, director of the Longevity Institute at USC and the Program on Longevity and Cancer at IFOM in Milan, designed the FMD after making a series of remarkable discoveries in mice, then in humans, indicating that specific diets can activate stem cells and promote regeneration and rejuvenation in multiple organs to significantly reduce risk for diabetes, cancer, Alzheimer's, and heart disease. Longo's simple pescatarian daily eating plan and the periodic fasting-mimicking techniques can both yield impressive results. Low in proteins and sugars and rich in healthy fats and plant-based foods, The Longevity Diet is proven to help you: - Lose weight and reduce abdominal fat - Extend your healthy lifespan with simple everyday changes - Prevent age-related muscle and bone loss - Build your resistance to diabetes, cardiovascular disease, Alzheimer's and cancer Longo's healthy, life span-extending program is based on an easy-to-adopt pescatarian plan along with the fasting-mimicking diet no more than 4 times a year, just 5 days at a time. Including 30 easy recipes for an everyday diet based on Longo's five pillars of longevity, The Longevity Diet is the key to living a longer, healthier, more fulfilled life.